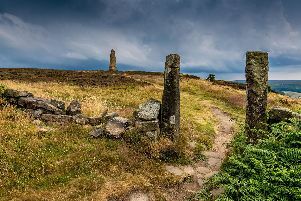 Archaeologists in the North York Moors National Park who are investigating the hidden past of the Victorian mining industry are offering guided tours to visitors throughout the next week. The tours will run twice daily today (July 4), tomorrow, Friday and Saturday, 11am and 2pm and again from Tuesday to Saturday next week (July 10 to 14). The site of the excavation, which lies in Combs Wood near Beck Hole, was once a hive of industrial activity. During the mid-19th Century, numerous ironstone mines and their associated buildings dotted the hillside. Te industry was short-lived, as landslides buried the mines and problems beset the nearby furnaces at Beck Hole. Now, thanks to the support of National Lottery players, archaeological methods are being used to find out more about the structures in Combs Wood as part of the Land of Iron project, funded through the Heritage Lottery Fund (HLF). Tom Mutton, Land of Iron Programme Manager at the North York Moors National Park, said little is known about the site and he is hoping to find answers. “We want to know how these buildings fit into the history of the area and discover how the people who shaped this landscape lived and worked,” he said. “It’s not often members of the public get an opportunity to visit an active archaeological excavation, so we’re delighted to be able to offer guided tours from Goathland. The Combs Wood Excavation tours are free. Visit www.northyorkmoors.org.uk/events for more. Each tour must meet at the National Park car park in Goathland, there is then a walk down to the site.